Make your New Year's celebration a memorable one at the beautiful Sunmarina Hotel. Stroll the scenic grounds or view local sea life in the unique saltwater pool in the lobby before starting off the evening's festivities with a special New Year's Eve dinner at Dining Room SENSES. Both course and deluxe buffet meals will be available from18:00 to 22:00 (last order 21:30). 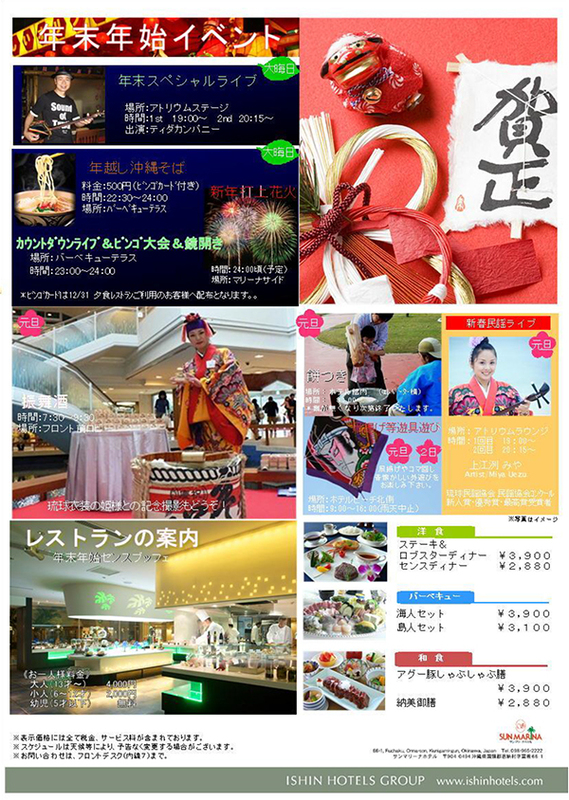 The buffet is 4,000 yen for adults, 2,000 for children 6-12 years old. Children 5 years old and under dine for free. Live entertainment will be featured on the Atrium Stage at 19:00 and again at 20:15. The countdown event will take place on the Barbecue Terrace from 22:30 to 24:00 at a cost of 500 yen. This final event of the year will feature live entertainment, a bingo game and a countdown toast. The evening will end with a spectacular fireworks show. Sunmarina will also start the year off right beginning from 7:30 on New Year's Day with a celebration featuring Japanese sake served in the lobby. Look for other activities throughout the day to include traditional Japanese New Year's mainstays such as mochi (sweet rice paste) pounding and even kite flying. The evening will be topped off with live Okinawan folk music performances on the Atrium Stage.